If I had to describe my preseason preparation I would have to with one word, limited. By limited I mean an extremely rigorous training program and diet along with a few days at a local indoor karting track, but nothing that included six gears. That is why in late February I made plans to visit the PCR Factory just outside Milan and to test with the factory team, I was over the moon. If I had one opportunity to get behind the wheel of a kart between the SKUSA SuperNationals in Las Vegas and the upcoming SKUSA SpringNationals in Phoenix, I couldn’t have chosen a better opportunity than to visit the Scuderia themselves. To put my situation into perspective for those of you in the United States, I am currently living in Germany for the second time, albeit much shorter (6 months) to assist my German major and international business minor (I also will be obtaining a major in marketing and another minor in entrepreneurship as well). 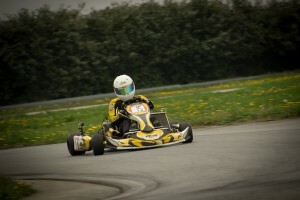 The first time was from 2012 to 2013, in which I took a sabbatical from karting, not only for the educational experience, but also because I was also very upset with the politics and the number of engines in premier division (TaG) at the time, but I digress. This is what made my switch in 2014 to the Stock Honda division so crucial to my racing career. I felt it was completely reborn. Not only was driving with six gears more fun than one, but I found that a lot more of the weight was shifted towards the driver rather than setup and engines. This is where things started to get tricky. As an aging old dog in this ultra competitive sport we call motorsport, racing had to take a back seat as I was not only making time commitments to my education, but now monetary commitments to my university as well. This has caused my seat time to suffer, making off track preparation more important than ever. I am coming off an ultra competitive run at the SKUSA SuperNationals in November, where we would win one heat race and compete for the win in the final before a mechanical failure ended our day. My father and I knew we couldn’t just let this new fire in our bellies go and made a commitment to run the full SKUSA Pro Tour this year, even with logistics being a problem with my new residency in Europe. This is where my trip to the factory factors in. It wasn’t until about February that we got the ball rolling with the idea of testing overseas knowing it would be too expensive to fly over and test. This is where Checkered Motorsports, who have supported me since 2009 come into play. If it wasn’t for them I wouldn’t have had the awesome experience to visit the PCR headquarters. Once the plans were set, I was on a plane to Milan where Silvia Bascialla and Daniele Pignatelli, employees of Scuderia PCR, greeted me with open arms into their home. After a quick recharging stop overnight, we were up by six to make the 300km drive to Busca. The funny part about this drive is that I would be driving with Daniele, who does not speak a word of English. So for the next three hours we would either be silent or using google translate to speak to one another! Now as the weekend went on and we warmed up to each other and used more body language to communicate, but I was fortunate to not only have Silvia for English translation, but also a Swiss at the race track, with whom I could speak German to. A full plan was set out for the next two days of testing so that not only would I be getting much needed seat time, but the factory would also be getting much needed feedback from me on their new 2016 line of chassis and which frame to sell to the U.S. market this year. It felt so organized, almost like a Formula One test! In particular, I really enjoyed doing the long runs because it helped me confirm that I was in shape enough, even after six months out of the seat, to tackle the long races in SKUSA. The only problem? Precipitation, and lots of it. The day started off slow with a completely wet track with more rain in the forecast for the rest of the day. However, this wouldn’t stop the eager beaver that was me from getting on track in my TM KZ10b powered PCR Mxk8. 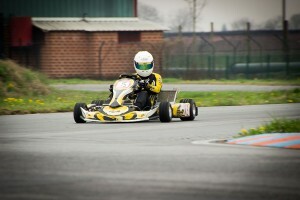 Heck, I had only driven a shifter kart twice in the rain prior, so I could use the practice! That is where things got quite embarrassing though. I was really uncomfortable in the kart and I couldn’t put my finger on why I was. Regardless, as I started to bring the kart up to pace, I just overcooked it on the (front) brakes at the end of the straight, putting me into the fence and sidelining one of the chassis for a few hours. When I jumped in the second chassis, I felt right at home. It was about that time I realized that it was the stiff IMAF seat that was not allowing me to drive the way I drive, but the familiar (and softer) Greyhound seat in the second chassis did. Not only was I faster, but I felt like I hadn’t skipped a beat and kept clicking laps till the track got dry enough for a few dry runs at the end of the day. By the end of the day, I had compiled hundreds of laps, learned a few things and gotten to within three seconds of a very good dry time on a damp track. Day two consisted of more of the same, although we were supposed to have a completely dry track. Not only was it still damp in the morning due to the clouds, but it would begin raining again mid day, causing us to switch back to rain tires. Now I would have loved to have learn rain setup from the factory, but the conditions were changing every 15 minutes and we were chewing up rain tires due to the light precipitation and the rain coming and going. I did pick up a few tips for the rain, such as using the curbs aggressively around the one mile Busca circuit, which is incredible by the way. It has a great mix of high speed and low speed corners that really challenge the driver as the track varies in width and banking as well. Once we got back to dry running, we had a much drier track than the day before. We had both chassis at our disposable on this day and while I was happy with both chassis, it was quite hard to compare them as the seats were vastly different and the conditions were so poor and often were changing. In the end, we are going to use data from Phoenix to decide the chassis sold in the U.S. this year as I didn’t think it was fair to both chassis given the conditions. In the dry conditions, I was running the unfamiliar Vega blue tire. While I was as fast as many of the other competitive KZ drivers attending the test, I found it hard to be consistent and to not overdrive the kart. This is where I was starting to get nervous, I still wasn’t 100% ready in my opinion for Phoenix and time was ticking fast on my track time. However, I got my hands on some used MG yellows for my last two runs of the day and everything felt just right at home. I was much more consistent and faster as well. So fast so, that with puddles still on the racetrack I was within six tenths of my compatriot AJ Myers best time at the circuit, a very good ending to an overall incredible learning experience. 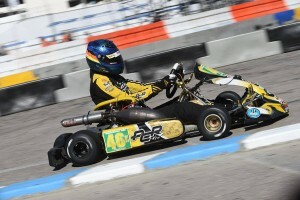 In fact, I was able to top the time charts both days in wet and dry conditions, which really had me cheesing as I left the track and shifted my focus towards the SKUSA SpringNationals. The tire switch also left unfinished business and a feeling knowing that I would have a lot to learn to compete in KZ in Europe. The amount of different series, tires and asphalt types are incredible in Europe and knowing how to optimize your chassis but also your driving style to all of these conditions would be a very tough task for the average racer. As the clock hit about 6 o’clock that was it, my 48 hours at the Busca circuit were over and I was headed back to Milan. However, not without an action packed Monday planned before my flight back to Germany! Upon arriving back in Milan I was able to just catch a little recap of the Bahrain GP, albeit in Italian. It was really intriguing to see how devastated the Italians were with Sebastian Vettel’s engine failure, showing me just how passionate the “Tifosi” is. Motorsports runs in the blood of Italians and it was incredible to experience it first hand seeing a ton of people show up to the track, regardless of age or skill just to feed their appetite for adrenaline. I even met a driver who would come to the track during his lunch breaks from work! Fast forward to the next morning and I was off to visit the facilities that manufacture the PCR line. Currently, PCR is building a new factory that will house all facilities on one site. However, for now, the assembly facility and the manufacturing facility are in two different locations. First off was a stop at the small shop that turns a standard frame into a rolling chassis. While small, the facility is filled with hundreds of frames and parts ready to be assembled for shipping or race team purposes. Following a quick tour, we made the hour long trek to the manufacturing facility. Not only was finding the land difficult to bring the two branches together, but the FIA also has rules of their own as to how and where a factory can be built. Come this summer, this hour drive should vanish and all employees will be on one location. The two buildings on location were the offices of the factory, which included a lot of cool pictures, trophies and karts, including Kimi Raikkonen, Gincarlo Fiscella and even Checkered Motorsports own Robert Bujdoso! It was extremely humbling to see the success the small team has had throughout the years, knowing that Checkered Motorsports is only playing a small role in the success and history of PCR. On a quiet Monday at the factory Daniele and I were joined by the only employee in the building. Did I say employee? I meant the founder, Mario! Walking around the factory is fascinating to see all the machines that go into making the thousands of parts and bolts needed to assemble a modern day kart. The precision is impeccable and knowing that the chassis I have won races and championships on were built in this very building, some 4000 miles from my home in Pennsylvania, was quite the experience. Not only was I able to see the past and present of PCR, but also the future. Computer rendering of not just aesthetic items, but also items in research and development reassure my confidence in the PCR brand going forward. Just when I thought it was time to leave, I was being put to work loading up parts to be brought back to the assembly facility! Before leaving the site, I had the opportunity to visit the factory next door which belongs to the current owner of PCR, Cesare. 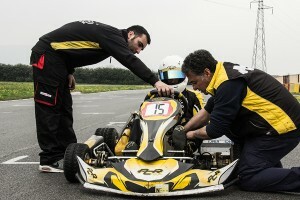 Cesare was at the track over the weekend, but was quite busy with family and customers. We had a nice chat about my findings when testing the new frames and talked about the future of PCR in America, which also looks as bright as ever! Upon leaving the factory, I still had a few hours before my flight, so why not see one of the most legendary karting circuits in the world, Lonato? We were not able to test at Lonato as they had a race the following weekend, but that didn’t stop many from showing up on Monday and utilizing the rubbered up track for their own testing needs! On the way to the track and just a short few minutes after passing the CRG Factory I saw the legendary South Garda Karting grandstands in the distance. Finally arriving at Lonato was something special, even if I didn’t have the opportunity to drive it. The track I was standing on was the mecca of Karting. What Monaco is to F1, what Le Mans is to sports car racing, what Augusta National is to Golf, that is Lonato in karting terms. Knowing World Champions and some of the best drivers to ever get behind the wheel had driven here was yet another humbling experience of mine in Italy. However, before I knew it, it was time to hit the airport and my time with the Scuderia was over, but I couldn’t think of a better cherry to top off my sundae of a weekend than visiting Lonato. Now I was not competing at WSK or a big event, but if I had to compare American karting to that of Europe with my small glimpse, it would be comparing 70’s F1 to today. The commitment needed to get every single detail right and to win here is incredible. In the US, you could potentially be off on setup and outdrive your opponents, but here every detail is taken up a notch. Could I be successful in Europe? I probably will never know, but I do know that it would take a much larger commitment, both in terms of time and money to be successful here. 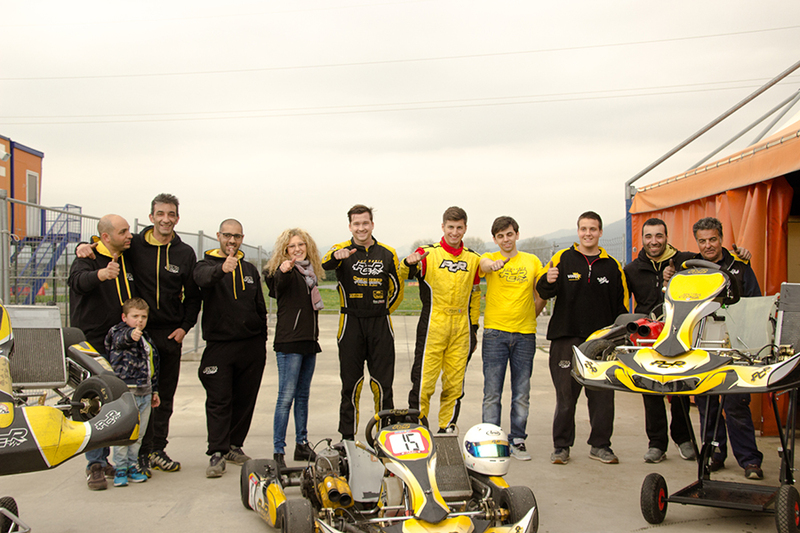 All in all, it was a priceless experience and I can only imagine the skill-set that drivers like Logan Sargeant and Anthony Gangi Jr. are developing running overseas full-time! In closing, I hope you enjoyed reading my diary of my time in Europe just as much as I enjoyed reflecting on my experiences and I look forward to seeing many of you in Phoenix for the SKUSA SpringNationals….and beyond!